My last small collection post - am working on some tutorials to come soon! This (small) collection started simple enough: picking up one of these glasses at the thrift store, coming home, loving it and deciding, "I love this and I'd love to have all my glasses be amber glass," and making it happen. I suppose that's probably the story for most any collection. So here it is, my amber glass tumbler collection. With the exception of the vertical ribbed two on the right (from Anthropologie), each glass was bought independently. I'd like them to be all sorts of styles but keep coming across this circle ones. Again, I really just keep an eye out at thrift stores (or the sale section of Anthropologie) and am building it slowly. 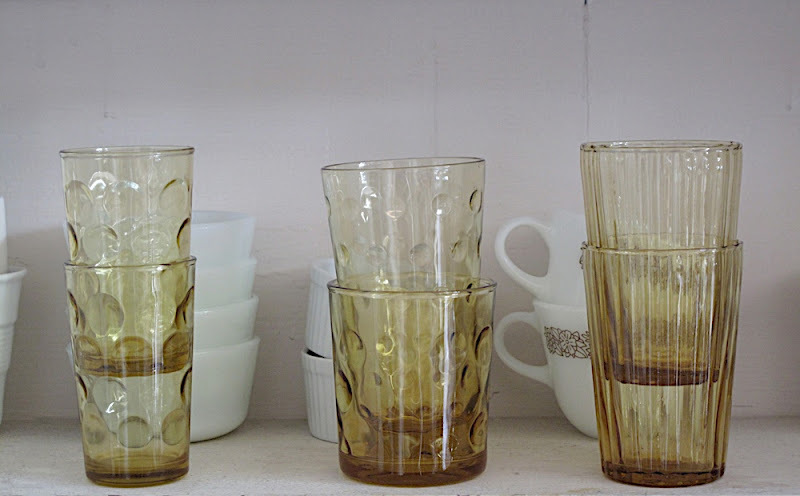 The internet tells me that three of them (not the ribbed, and not the top middle glass) most likely are the El Dorado pattern. The internet also showed me they exist in avocado color which I'd really like to meet one day. Those are really beautiful, and a lovely warm colour! I didn't thought I have a collection, but I guess when i counted them all -I guess I do!